Tire rotation is an important maintenance duty that extends the life of your tires and ensures safe driving. Let’s take a look at this simple and effective procedure. The main reason to rotate your tires is because the front and rear tires wear differently. Think about it, parallel parking, three-point turns, with each turn of the steering wheel there is pressure put on the front tires. This is even more true for front-wheel drive vehicles. Resistance causes friction, friction produces heat. The result? The front tires will wear quicker than the rear. Because of this, it’s necessary to rotate your tires front-to-rear several times during their life cycle. The best indicator that it’s time to rotate your tires is uneven tread wear. If you look closely at your tires, is the inside or outside of one tire showing more wear than the other? Because the weight of a car isn’t evenly distributed to all four corners, uneven tread wear is unavoidable. Most engines are located in the front of the vehicle and since the engine is the heaviest thing in it, the front tires carry more weight. All of these factors contribute to the front tires wearing out faster than the rear tires. When we rotate the tires, each tire is being moved to a different corner of the car to make it possible for them to wear more evenly. 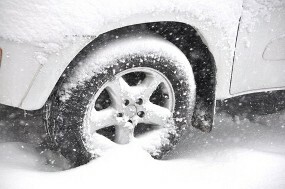 Other indicators that the tires need to be rotated are poor handling when braking your vehicle, or poor tire traction in wet or slippery road conditions. A general rule of thumb for rotating tires is every 3,000 to 7,000 miles. But your vehicle’s manufacturer’s manual will have recommended rotation times. Keeping a log of when you’ve had tire rotations can help you stay up to date. Keep the log in your glove compartment for a quick and easy reference.